Suzuki Motor of America announces the 2015 TU250X | Throttle Life! With appealing style that recalls yesterday’s treasured motorcycles, the Suzuki TU250X combines classic two-wheel design with performance features today’s riders demand. Suzuki Motor of America, Inc., (SMAI) announces the release of the 2015 TU250X, arriving in Suzuki dealers this month*. 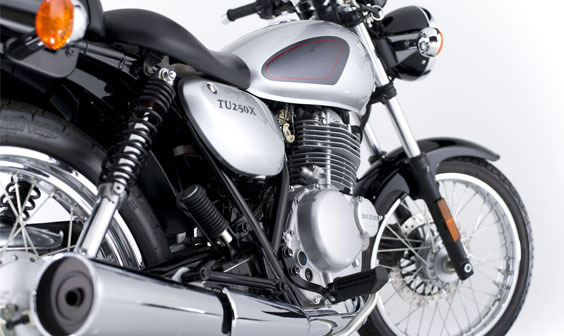 The 2015 Suzuki TU250X is a modern motorcycle wrapped in retro bike style. The TU250X runs on chrome-plated spoke wheels, and the front wheel is stopped by a hydraulic disc brake using a dual-piston caliper for consistent brake activation. The single-cylinder, 250cc air-cooled engine exposes its cooling fins for old-school style, while modern performance is enhanced by the Suzuki Dual Throttle Valve fuel-injection system and digital ignition. The engine is tuned to deliver strong low-end torque and quick throttle response, while it lets riders enjoy gas-sipping fuel economy. And the 3.2-gallon fuel tank means riders will enjoy long road sessions with few stops for fuel. The bike’s exhaust system is complete with a catalytic convertor to help keep emissions low. The TU250X is a good fit for many entry-level riders, with the long and comfortable padded seat positioned low for a seat height of just 30.3 inches. Veteran motorcyclists will enjoy the bike’s modern ride, along with timeless features like the round headlight, sweptback and low-slung chrome exhaust, polished crank side case and more. A classic steel-tube frame and naked styling helps keep the TU’s curb weight down to just 326 pounds. 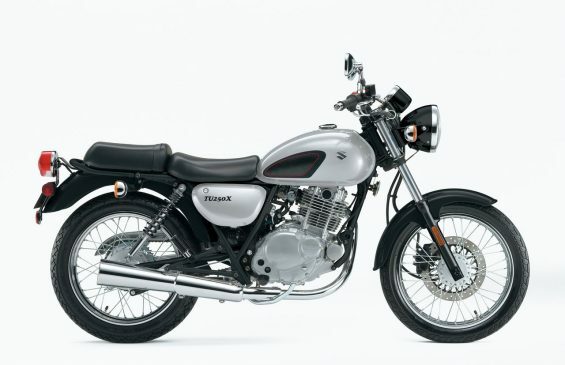 The 2015 Suzuki TU250X is available in a Metallic Silver-and-Glass Black style, at a suggested retail price of $4,399.